$109.99 This item is selling for $109.99 on eBay. 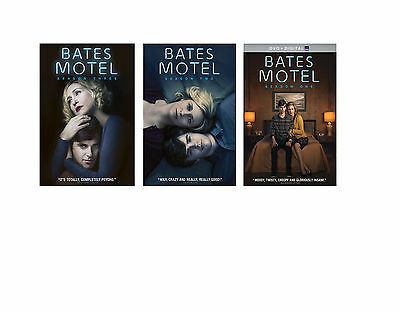 BATES MOTEL Complete Series First Second Third Season 1 2 3 DVD Set TV Show Vera Genuine U.S. Retail Release, Brand New, Original Factory Sealed Season 1 Special Features Disc 1: Includes UltraViolet (Subject to expiration. Go to NBCUCodes.com for details.) Deleted Scenes Disc 2: Deleted Scenes Disc 3: Deleted Scenes Paley Center Panel Discussion with the Cast and Creative Team Product Details Actors: Vera Farmiga, Freddie Highmore Format: Multiple Formats, Ultraviolet, Color, NTSC, Widescreen Language: English (Dolby Digital 5.1) Subtitles for the Hearing Impaired: English Region: Region 1 (U.S. and Canada only.) Aspect Ratio: 1.78:1 Number of discs: 3 Rated: NR (Not Rated) Studio: Universal Studios DVD Release Date: September 17, 2013 Run Time: 435 minutes From the producers of Lost and Friday Night Lights comes a modern day prequel to the iconic horror film Psycho. After finding his father dead, teenager Norman Bates (Freddie Highmore, Charlie and the Chocolate Factory) and his mother, Norma (Academy Award nominee Vera Farmiga), purchase a motel and move to White Pine Bay in search of a new life, but they soon discover this idyllic seaside town hides some deadly secrets. Unable to trust anyone but each other, the two indulge in a deeply twisted relationship that raises the question: does mother really know best? Watch every episode back-to-back and uninterrupted of the murderously suspenseful drama that tells the story behind one of the most iconic characters in movie history. Season 2 Special Features Disc 1: Deleted Scenes Bates Motel: After Hours – Season Two Premiere Disc 2: Deleted Scenes Disc 3: Deleted Scenes Origins of a Psycho: Inside Bates Motel Bates Motel: After Hours – Season Two Finale Product Details Actors: Vera Farmiga, Freddie Highmore Format: Multiple Formats, Box set, Color, Widescreen, NTSC Language: English (Dolby Digital 5.1) Subtitles for the Hearing Impaired: English Region: Region 1 (U.S. and Canada only.) Aspect Ratio: 1.78:1 Number of discs: 3 Rated: NR (Not Rated) Studio: Universal Studios DVD Release Date: October 7, 2014 Run Time: 428 minutes Season 3 Special Features Disc 1 - Bates Motel Season Three: Deleted Scenes Disc 2 - Bates Motel Season Three: Deleted Scenes Disc 3 - Bates Motel Season Three: Deleted Scenes A Broken Psyche: Creating Norma-n Product Details Actors: Vera Farmiga, Freddie Highmore Format: Multiple Formats, Box set, Color, NTSC Language: English (Dolby Digital 5.1), Portuguese (Dolby Digital 5.1), Spanish (Dolby Digital 5.1) Subtitles: Portuguese, Spanish Subtitles for the Hearing Impaired: English Region: Region 1 (U.S. and Canada only.) Aspect Ratio: 1.78:1 Number of discs: 3 Rated: NR (Not Rated) Studio: Universal Studios DVD Release Date: October 13, 2015 Run Time: 429 minutes "Bates Motel" returns for a gripping third season filled with family strife, murder and mystery lead by Vera Farmiga (Norma) and Freddie Highmore (Norman). This season focuses on the evolution of the Bates family and dives head first into Norman's waning ability to stay in denial about what's happening to him and the lengths he will go to gain control of his fragile psyche. The dramatic events of last season leave Norma (Vera Farmiga) more aware of Norman's mental fragility and fearful of what he is capable of. From executive producers Carlton Cuse ("Lost," "The Returned") and Kerry Ehrin ("Friday Night Lights," "Parenthood") "Bates Motel" serves as a contemporary prequel to the genre-defining film Psycho and provides viewers with an intimate portrayal of how Norman Bates unravels through his teenage years. After a blissful summer of closeness with his mother, living within the safe confines of home and the Bates Motel, Norman's fears about what really happened with Blaire Watson resurface and Norma questions what really happened. Forced to look at the truths about Norman for the first time, their deeply intricate relationship continues to evolve. Norma finds herself turning to the other man in her life, Norman's half-brother, Dylan (Max Thieriot) and begins to rely on him in ways that she never expected. This relationship inevitably triggers jealousy in Norman and a new kind of love triangle between Norma and her two sons erupts. Estranged brother and uncle, Caleb (Kenny Johnson) returns to haunt the family throughout the season challenging the family bond even further. Pressures of the outside world take a hold of the family when newcomers Kevin Rahm ("Mad Men," "Desperate Housewives"), Tracy Spiradakos ("Revolution") and Ryan Hurst ("Sons of Anarchy") arrive at White Pine Bay. After a summer of living at the Bates Motel, Sheriff Romero (Nestor Carbonell) and Norma have grown closer but there will always be a troubling question mark surrounding Norman. Something doesn't feel right, but in spite of his instincts, Romero finds himself continually drawn back to the Bates family - and to Norma. Emma (Olivia Cooke), determined to find out what is happening to Norman, becomes more emboldened and goes after the things she wants. Familiar face, Bradley (Nicola Peltz) returns to surprise the family and digs up old memories. Our items are shipped from multiple locations in the US; we tend to ship from the states that are closest to your location if those states have the ordered items. All of our items are 100% GUARANTEED AUTHENTIC US RETAIL DVDS OR BLU-RAYS; we do not sell copies or bootlegs! They are all purchased directly from U.S. authorized suppliers, distributors and warehouses. PayPal only. It is your best protection as a buyer. Payment Method Shipping Handling Terms Free standard shipping to the Continental USA Only. No PO/APO Boxes. Trust also in our fast customer service, providing immediate assistance if necessary. International Shipping: We will work with's Global Shipping Program on eligible items. will charge fees and manage the shipment once they receive the package.